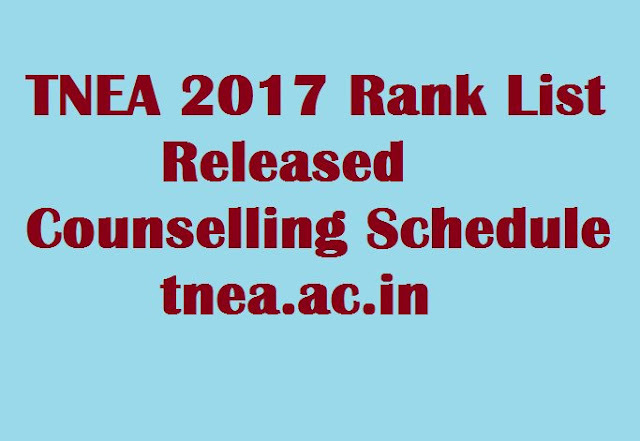 TNEA Rank List 2017: The Anna University has invited candidates for admissions through merit based. Recently, TNEA Random Number 2017 has released @ tnea.ac.in. As per the schedule, authorities have uploaded TNEA 2017 Rank List on its official web portal at tnea.ac.in, annauniv.edu. The Top Rank holders may get more chances to select in the college. According to the tnea.ac.in report, today on June 22 the Anna University Rank Card has released. Candidates shall get your TNEA Merit List by entering your Application Number & Date of Birth (DOB). The Random Number is essential to sort the ranks. The TNEA 2017 Rank List is allotted based on Cutoff Score, Fourth Subject Score, Date of Birth and Random Number. Tamilnadu Engineering Admissions (TNEA) is provided by Anna University. It is a technical university in Tamil Nadu. It became an affiliated University in the year 2001. The Anna University was established on 4th September 1978 by Tamil Nadu Act 30 of 1978. In the year 2007, it has split six constituent universities at Chennai, Coimbatore, Madurai, Tiruchirapalli and Tirunelveli. According to this information, aspirants are supposed to download TNEA Rank List 2017. More than 1.5 Lakhs students enrolled for Engineering College of Tamilnadu Admissions. It is compulsory to download Anna University Rank Card from online portal at tnea.ac.in. Qualified candidates have to attend TNEA 2017 Counselling. The direct link of TNEA Rank List 2017 will make available in this web page. The Tamilnadu Engineering Admissions through Single Window Counselling Schedule will update very soon. Candidates need to download Counselling Call Letter from tnea.ac.in. Therefore, more details regarding TNEA Seat Allotment & Counselling Dates may update here. The total includes 573 differently-abled candidates, 2,105 sports category candidates and 2,027 candidates who are wards of ex-servicemen. 71,275 are the first generation candidates. For downloading the TNEA Rank List, it would be beneficial for the aspirants to have a PDF reader in your system.In case the candidates have any doubts they can contact tneaenq2017@annauniv.edu or phone number 044-22359910 / 22359911.